Wat Gahndahl is located on the east bank of the Sanker River, the temple is a simple and run down place. There is an unusual wall mural on the outside of the temple that features a progressing story of a bad dude that apparently killed his own mother and finally had to board a boat bound for hell. The interesting feature of this wat is the Angkor replica about 110 meters sown a dirt path from the rear area of the temple. It was built in 1969 over a small concrete pool and is the pride of the monks staying there. They say spirits and relics of deceased monks are housed inside. 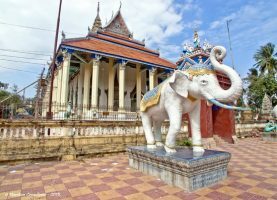 Battambang is not short on temples and you will see many more around town and on the way to the sights outside of town. Wat Gahndahl, Battambang is popular tourist attraction in the city. Battambang is one of the largest and the most populated city in Cambodia. The city boasts of many interesting places of sightseeing which has made the city one of the largest tourist destinations in Cambodia. 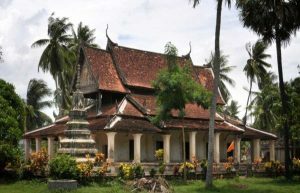 Wat Gahndahl, Battambang is among many other popular attractions that the visitors should not miss. Wat Gahndahl is a religious center and a temple considered to be one of the major tourist attractions in Battambang. The city of Battambang is known for a number of ancient temples and religious places. The travelers must pay a visit to all these places. 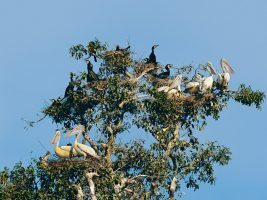 The temples and other interesting places can be explored by various day trips and excursion tours to the surrounding places. 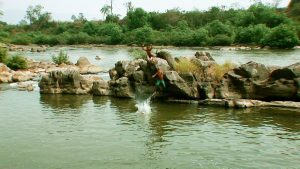 The ancient temple is situated at the Eastern shores of the river and an interesting place to be visited by the religious as well as regular travelers. The temple features an interesting structure especially the exterior parts. The structure of the temple was constructed in 1969 on a small concrete pool. The outside walls of the temple show a strange local story. According to the legends, there used to be a bad boy who killed his mother and as a consequence of that had to go to hell by boarding a boat. This story is engraved on the walls of the temple.